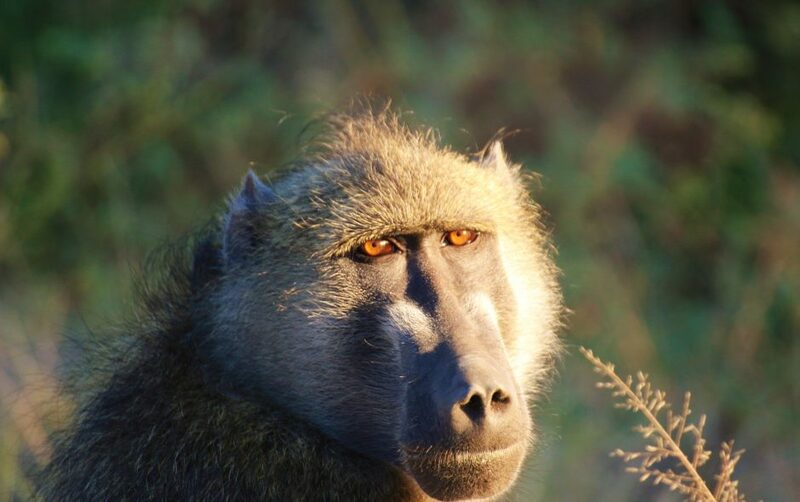 Bob was a name Britt and I gave to a problem male baboon while we were working at Savannah Camp. This fellow used to take great delight in tormenting us, raiding our kitchens and dining area and harassing staff. We could never get a bead on the fellow as he always saw us way before we saw him. He figured he was beyond reproach and with time became dangerous resulting in the necessity of someone having to deal with him with finality. Problem was, he kept outsmarting us.We remember Bob most of all because one day he was the cause of one of our best wilderness experiences ever. He got a little cheeky and couldn’t get away in time and his life ended prematurely. We decided to make use of him by placing him at the base of an old lead wood tree just 30m away from the camps bar. We strapped him to the tree so that if any scavengers came calling we would have time to watch a little before they made off with him. I know it sounds a little primitive, but to be honest, he had it coming. The following morning we woke up just an hour or so before sunrise to the sound of lions calling in the plains beyond the camps waterhole. It is always fantastic waking up to this kind of activity. As we lay there we remembered Bob and hoping that the nearby Lions would find him we decided to get in the vehicle and wait for this to happen. Problem. The vehicle was not outside our little home. It was at the bar and would require a little effort and a lot of risk to get there. We opted to go for it. It would be worth it. Home in itself is very much an overstatement for where we lived. We lived in a rectangular room about 3 by 6 m in size with a partition on one end with a bathroom behind it. The whole establishment was made out of reeds, its roof was a nylon buck sale and it had no windows, only gauze covered openings. Pretty rudimentary. The home was located between the kitchens and the staff camp and a good 50m from either. The entire camp was set under a grove of camel thorn trees and these produce a grey velvet protein rich seedpod shaped very much like an earlobe. I mention this because elephants love these pods and so before leaving home we had to make sure there were no elephants around. Many times in camp we found ourselves dodging between elephants and rushing from one building to another. This morning however, elephants we not our problem, lions were. We got up, got dressed warmly as it was winter and opened the door. As we verified that there were no immediate threats, we snuck off to the kitchens. Entering the kitchen back door we moved to the front door in relative safety. We were half way to the vehicle. Our next step was from the kitchen to the dining tent about 30m away. We followed the same protocol, checked our security and made a dash for it. 20m to go to the bar, and the vehicle. Nearly there. Britt opted to stay at the dining tent and wait for me to open the doors and get the spotlight out to make sure all was safe and this meant me doing the last stretch alone. No problem. I got to the Land Cruiser and opened the doors for her. She ran over and hopped in. Okay now we were ready. We put redirected the spotlights and found Bob where we had left him. We could hear the lions not all that far away and decided to see if we could go and find them. As we started the car we saw a shape emerge from alongside the dining tent where we had been only moments before. We froze. It was a leopard, a great big male Leopard. The lions were forgotten in a flash, we switched the motor off and watched. He stopped, he looked as us as though it didn’t matter whether we were there or not. He must have been watching us all the way from our cottage to the car and probably figured, “humans, so clumsy in the wild”. When he had finished insulting us, he slowly carried on directly to where Bob was and began to have breakfast. It was amazing to watch as he licked the hair off the baboon before digging in. We sat in stunned silence admitting to ourselves and to each other that to be a part of this incredible view almost as if we weren’t even there was indeed a privilege. As he and Bob became part of the natural order of things, the sun rose above the treelike covering them in a bronze glow. When he had finished he came back towards the vehicle and passed us close enough to touch. He hopped over the little demarcation of the campfire area and proceeded to climb onto the bar counter promptly falling asleep. The worst thing about this was that there wasn’t a single client in camp.